The midterm elections last November set right the perversion of democracy in Pennsylvania by the GOP-controlled state legislature. In recent decades, the GOP-controlled General Assembly in Harrisburg, after the decennial census, had redrawn congressional district maps. This is mandated by law. However, they did this in such a way as to give themselves undue advantages in the elections. Pennsylvania is a moderate state — socially conservative but left-of-center on economic and pocket book issues. In elections for U.S. president and U.S, Senate, the vote split between Democratic and Republican candidates is 45:55 swinging either way. We have voted for both Republicans and Democrats in presidential elections; we have had both Democratic and Republican governors and U.S. Senators. But the delegation to the U.S. House of Representatives tells a different story. It is skewed badly in favor of Republicans. In the 18-member congressional delegation from the state, the GOP/Democrat split is 13/5, giving undue weightage to Republicans. This is because of the way the GOP-controlled General Assembly in Harrisburg has drawn the maps for the congressional districts, through what is called gerrymandering. States redraw congressional district maps every ten years based on population changes. An article in the April 2018 issue discussed this at length. See here: www.tinyurl.com/Equitable-PA-House-Delegates. Early last year, in a law suit filed by the League of Women Voters, the state Supreme Court asked outside consultants to redraw the maps to make them more representative of the voting patterns of the state. In the mid-term November elections of 2018, with the redrawn maps for the 18 Congressional districts, the GOP-Democrat split is now 9:9, more reflective of our state’s political character. Yes, the unpopularity of Donald Trump in the White House also has contributed to this shift favoring Democrats. But even without Trump at the White House, with the redrawn map, the delegate to the US House of Representatives from the Pennsylvania would have been more equitable, more like 10/8 in favor of the GOP instead of 13/5. Thank you, the League of Women Voters, for bringing the law suit to the Pennsylvania’s Supreme Court. Thank You, the State Supreme Court, for forcing the redrawing of the maps for Congressional districts and making it truly representative of ethos of our citizens. This gerrymandering is common also in Democrats-controlled states and cities, where Democrats give themselves undue advantages in elections to stage legislatures and city councils. Gerrymandering not only perverts the very idea of “Representative Democracy,” but also always leads to corruption at many, many levels. The plot below encapsulates the population dynamics of our home state of Pennsylvania in relation to the population of United States. The U.S. population has been growing quite rapidly in the last century, from 76 million in 1900, 200 million in 1920, 250 million in 1990, to 320 million in 2020. The black line in the graph. 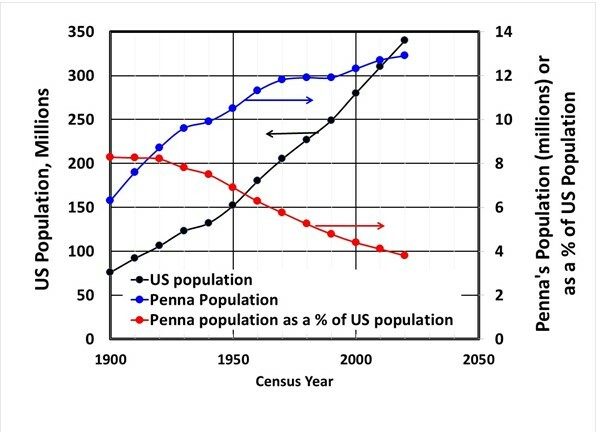 The population of the state of Pennsylvania is leveling off (blue line in the graph)we were just over 6 million in 1900, 10.5 million in 1950, over 12 million in 2000, and currently around 13 million. As a result, the population of the state as a percentage of the population of the nation has been declining (the red line in the graph). We were 8% of the nation’s population in 1900, and now we are under 4% of the nation’s population. The total number of members in the US House of Representatives in the US Congress is 435, fixed by the constitution. The number of House Members in each state is based on the population of each state relative to the population of the nation. 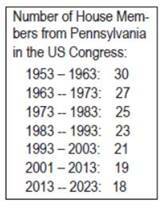 Since the population of Pennsylvania as a percentage of the U.S. population has been declining, the number of House members from Pennsylvania in the US Congress has been declining. We had 30 members in 1950s. Now, only 18. See the table. Republicans, having a majority in our state’s General Assembly in Harrisburg for long, have skewed the redrawing the maps of the congressional districts. The split between the two party’s Congressional delegation from Pennsylvania, is nothing but a scandal. This entry was posted on January 19, 2019, 12:15 pm and is filed under January 2019, Past issues. You can follow any responses to this entry through RSS 2.0. You can skip to the end and leave a response. Pinging is currently not allowed.